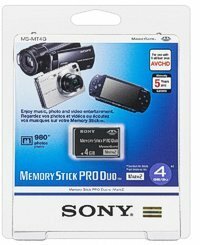 This Sony 4 GB Memory Stick Pro Duo / MS pro duo is for you to expand the memory capacity for your compatible device like cell phone, PDAs, digital camera, music players, gaming devices and more cool devices that are with a MS pro duo slot available. It is ideal for storing media-rich files such as music, videos, and photographs. Memory Stick PRO Duo is half the size of a standard-size Memory Stick PRO media and it offers the same technologies including high speed data transfer, built-in MagicGate, and high capacities. Sony memory quality for fast transfer rate for reliable copy, download, back-up. High Speed Memory Stick PRO Duo fits directly into new and upcoming Sony digital cameras and camcorders. IMPORTANT NOTE: 4GB is the physical memory storage capacity, actual available memory capacity is little smaller because of pre-setting card system files. Holding by the edges, insert memory card into digital device slot. Do not apply pressure to the center of the card. Memory can only be inserted one way. Refer to your device's user manual for more instructions.